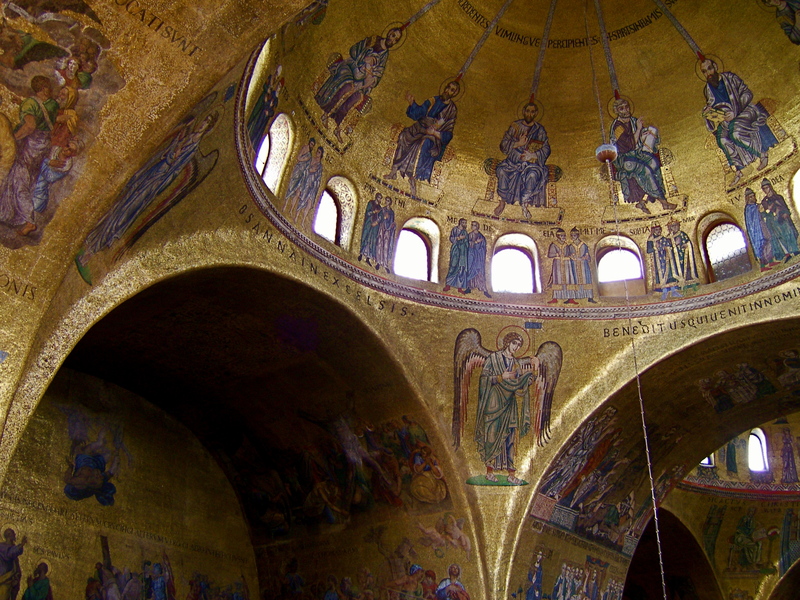 The interior of San Marco is aglow with golden light, caused by the gilded mosaic tiles, candle light, and of course sunshine streaming in during the day. 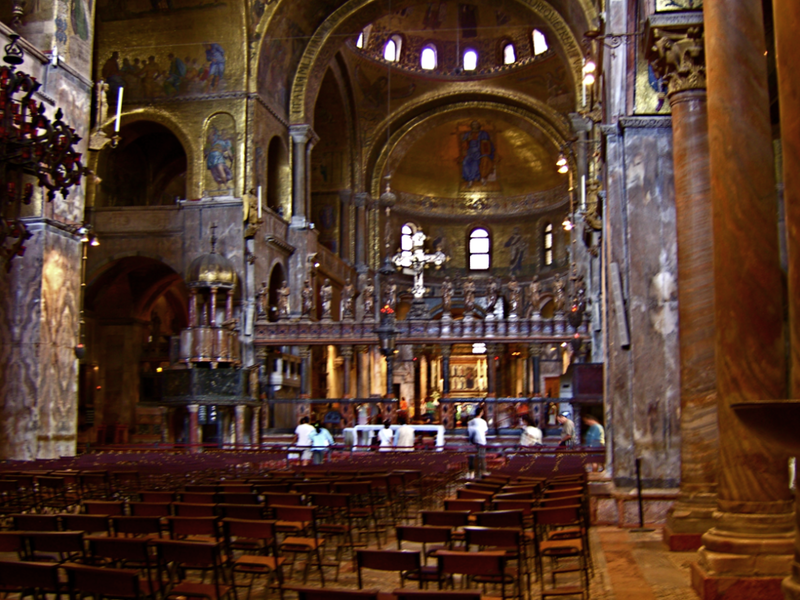 While the basic design is Greek cross Byzantine, the ritual is basilica-like, with the altar not in the center, but at the end of the third dome. 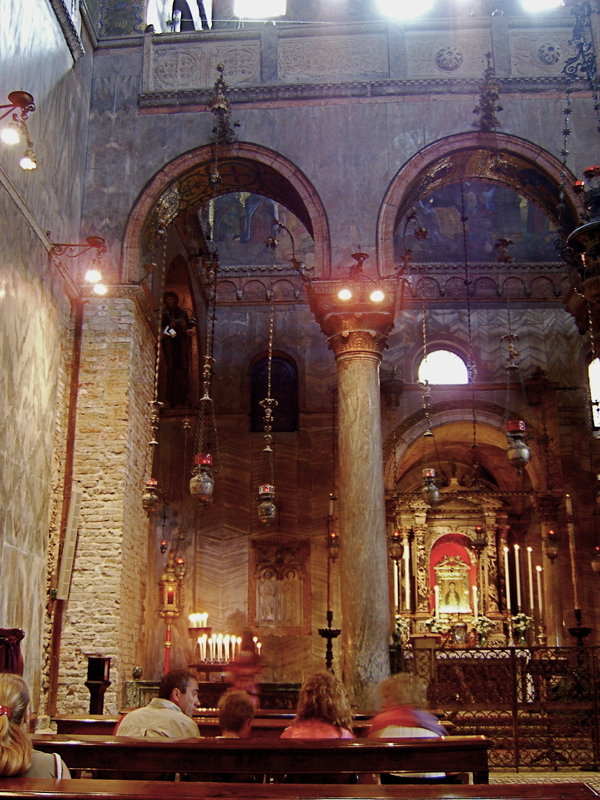 Notice the screen-like effect of columns supporting a strong horizontal, atop which are fourteen statues in marble. This separates the main body of the church from the altar area, yet is “transparent.” Known as an iconostasis, it was created in the 14th century by two brothers, Pierpaolo and Jacobello dalle Masegne. 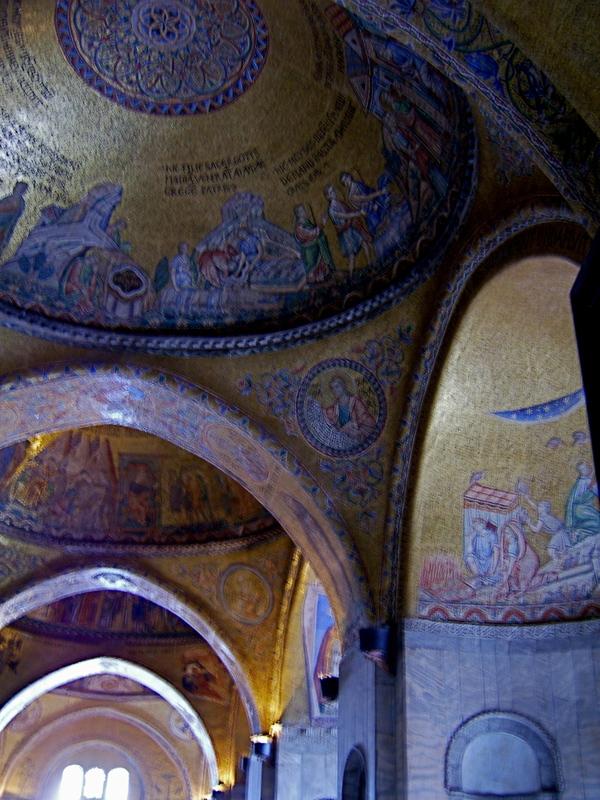 The figures represent the twelve apostles, St. Mark, and the Virgin Mary. This is the view from a pew, with the iconostasis in front of us. This view is from the upper balcony level, and gives us a better grasp of the entire nave-like interior, set beneath three domes in succession. One of a number of choir lofts located on the second level, from which a form of polychoral musical performances emanated. Possibly, one of the earliest forms of stereophonic music resulted when opposing choirs sang contrasting phrases of music. The altar with its retable behind. From the Latin for “rear table,” the expression usually refers to rather massive decorative elements in Spanish churches (retablo), but is used here as well, albeit with a slightly different spelling. 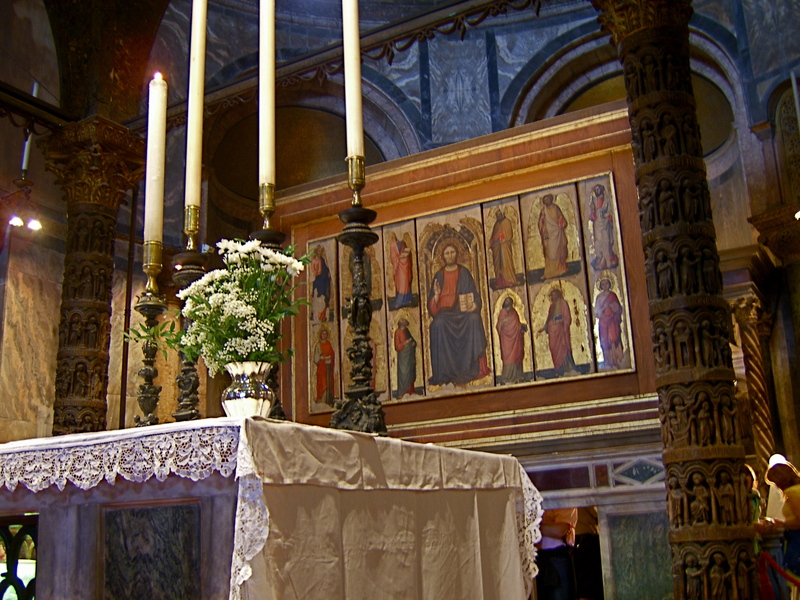 We shall go behind and explore the other side of that retable with its magnificent Pala d'Oro. 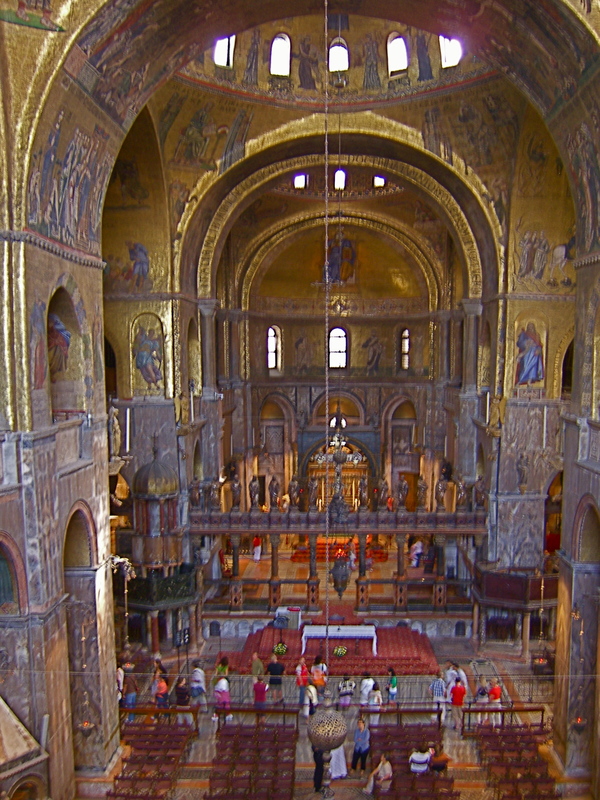 But before we do, a look at the baldachino (canopy), supported by four columns, which sits atop the burial place of St. Mark. 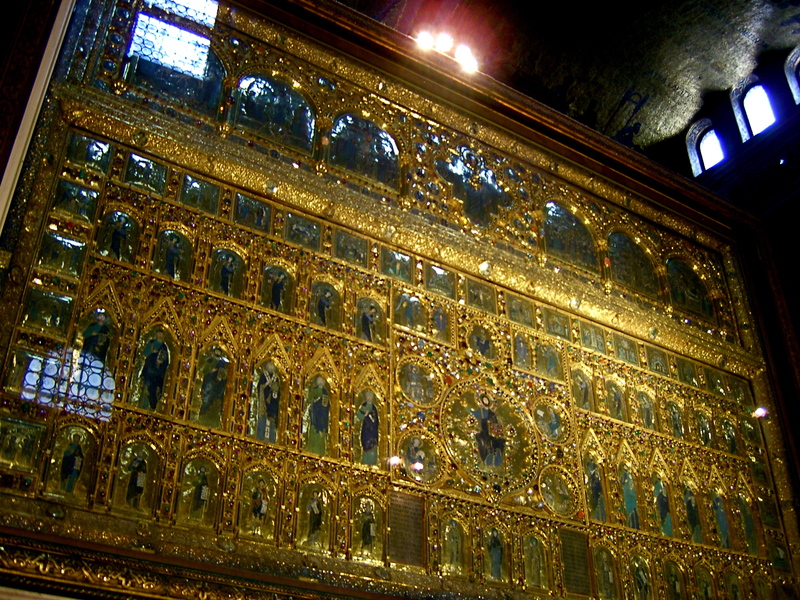 This image also gives us a better view of the front (actually the back) of the Pala d'Oro, the painted wood screen. 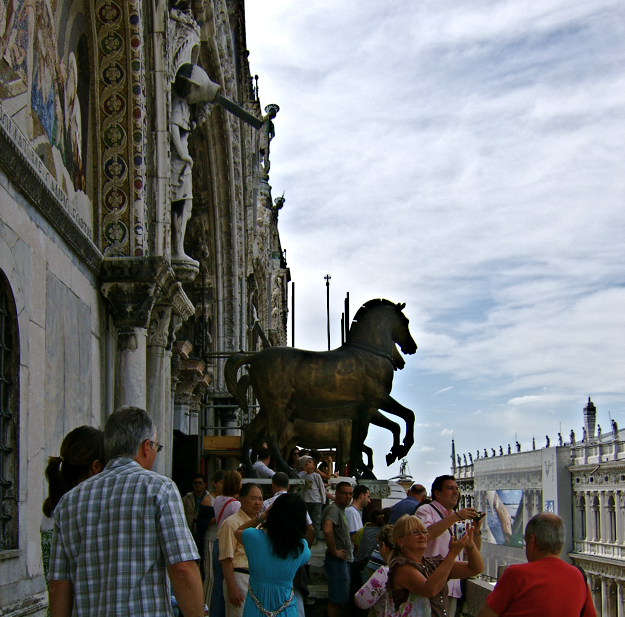 This is the Pala d'Oro, which, until recently, was only accessible during liturgical celebrations, and has been in this position since being brought in parts from Constantinople, in the Fourth Crusade (mentioned below in reference to the four bronze horses). There is an extra fee involved (after the general admission), but it is a once-in-a-lifetime experience. Apparently, the retable contains relics of Saint Mark. Pala is from the Latin for cloth, used to either cover an altar or to serve as a backdrop. Such cloths were often decorated. At some point the cloth was replaced with gold or silver, and hence the name (“oro” being gold). It supposedly was ordered by the Doge Ordelafo Falier in 1102, and completed in 1105. But in researching the Fourth Crusade, it is explained that all or some of this particular piece was “rescued, as described above.” Curiosity makes me question why it took 100 years to be brought to Venice. 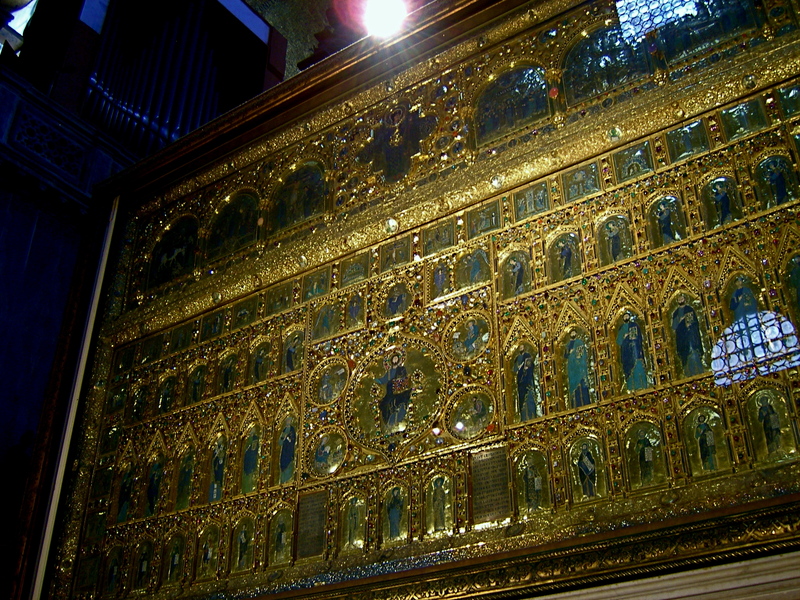 It is an altar piece with about 250 cloisonné enamels of different sizes and periods (10th - 12th century) on sheet gold. In the lower panel, above the great Christ Pantocrator (a title of Christ as the ruler of the universe, especially in Byzantine church decoration) in the center, there are evangelists, prophets, apostles and angels. 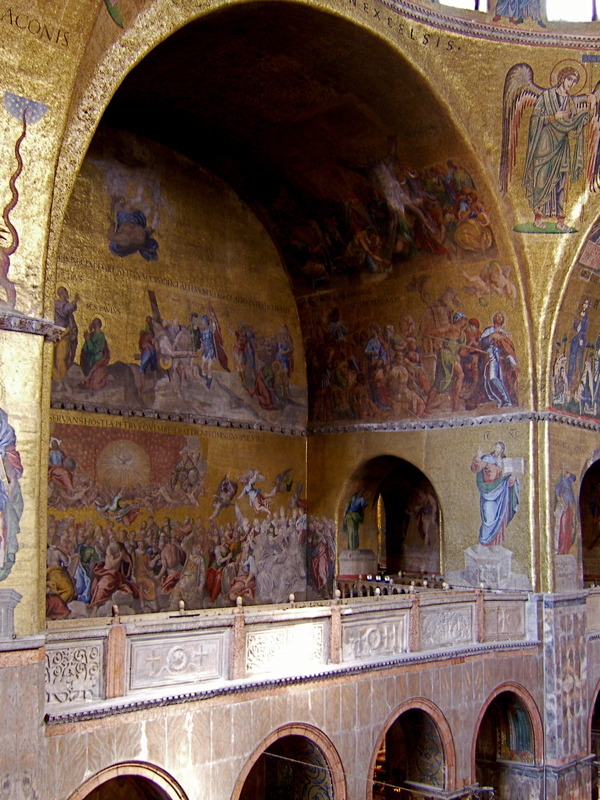 The small bordering panels portray episodes from the life of Christ and of St. Mark. The gilded silver Gothic frame was made in Venice in the mid 14th century. Numerous pearls and precious stones are set in the enamels. 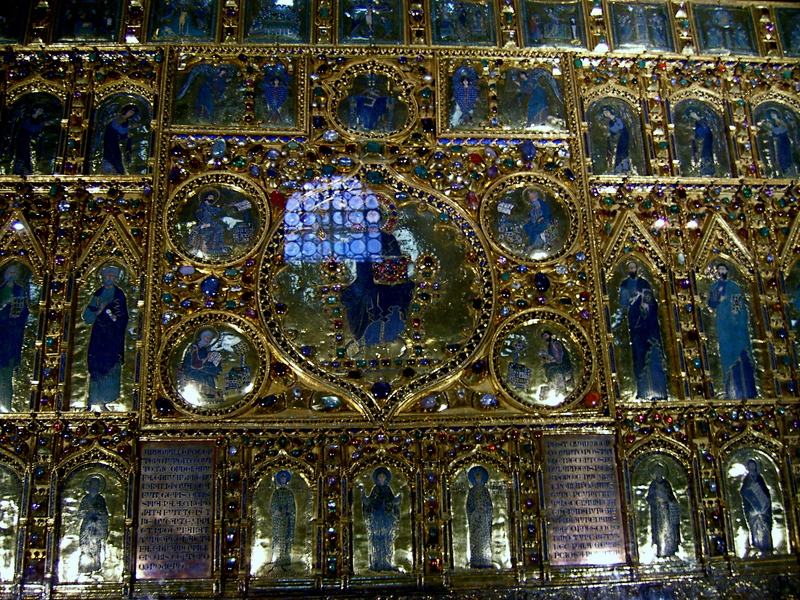 The pala d'oro is the world's only intact example of large size Gothic goldsmith's art. Three phases may be identified in the history of this precious work: - The lower part dates to the time of doge Ordelaffo Falier (1102-1118). The enamels on the side frames, with stories of St. Mark, and on the upper frame with six deacons and the Christological celebrations of the liturgical calendar date to the same period, as does the central Pantocrator group. The upper part belongs to the second phase. 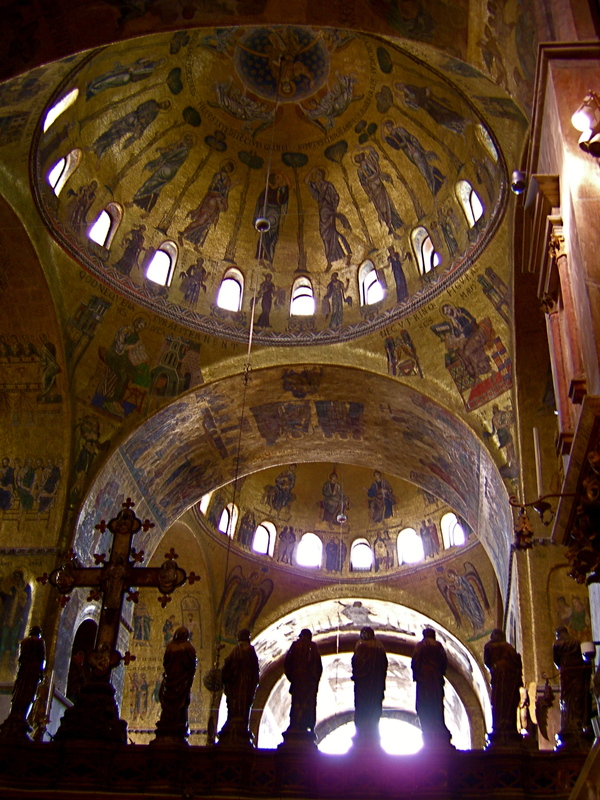 The series of six Byzantine celebrations and the archangel Michael in the centre perhaps arrived in Venice from Constantinople after 1204. 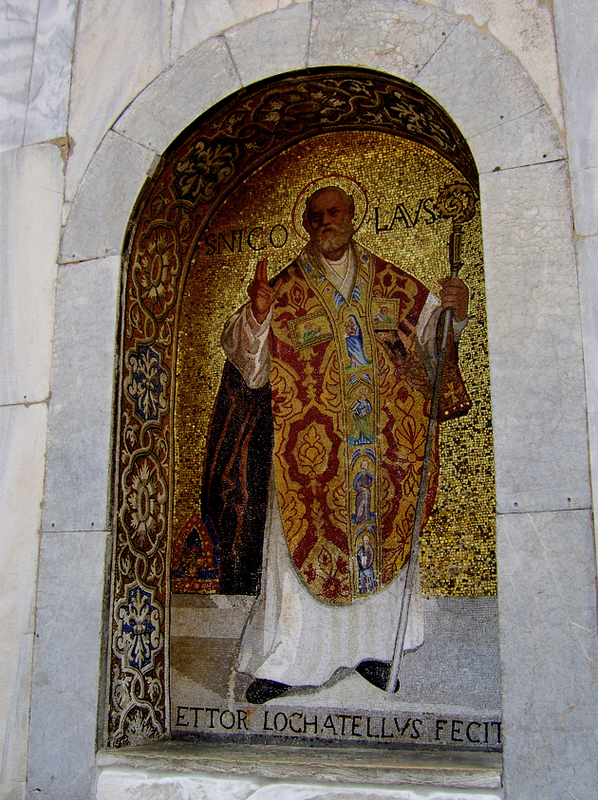 The third intervention occurred between 1343-1345 when, at doge Dandolo's behest, two Venetian goldsmiths were entrusted with the task of framing the whole within a Romanesque arch (upper part) and a Gothic arch (lower part), and distributing the 1.927 precious stones and gems. Please confer with me about the authenticity of this being the original. A good example of the spherical pendentive - the triangular warped surface, which forms the transition from the vertical pier below to the circular dome above. The golden domes and their supporting spherical pendentives seem to create a three-dimensional illusion of statuary, when in reality the figures seen are on and part of the surface of the structure. Windows ringing the base of the domes are in the section known as a "drum", a vertical area intentionally created to increase the height of the final dome as well as to provide light (we discussed this in our description of Hagia Sophia above). The domes themselves begin their curvature above that drum. Having light coming through so strongly sometimes gives an illusion that there is no support for the dome, and that the domes seem to be suspended in space – exactly the effect in Hagia Sofia. 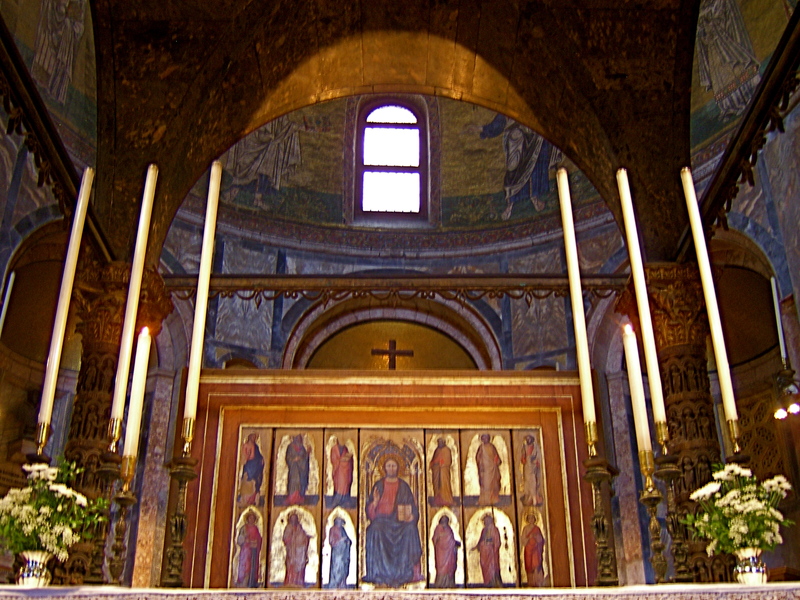 This is a view from behind the iconostasis (altar screen in nave). 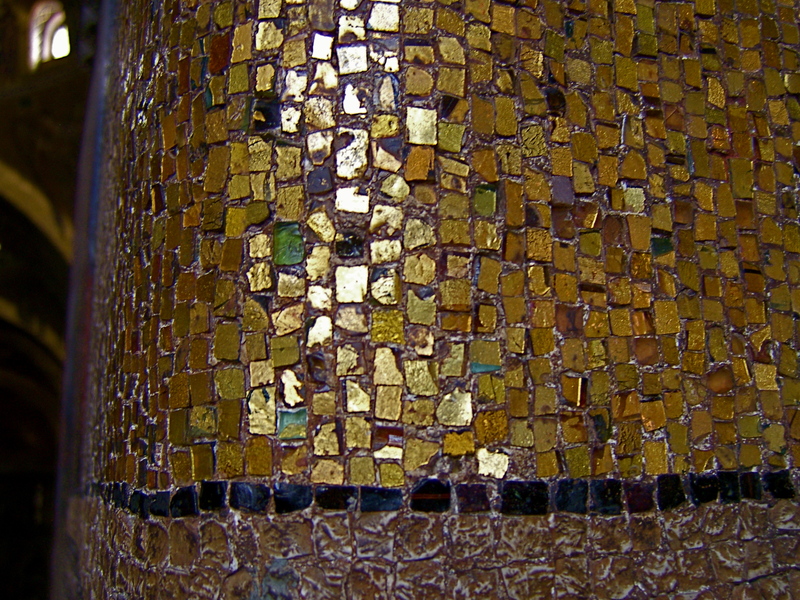 Everything is composed of mosaic tiles, obviously with many gilded. 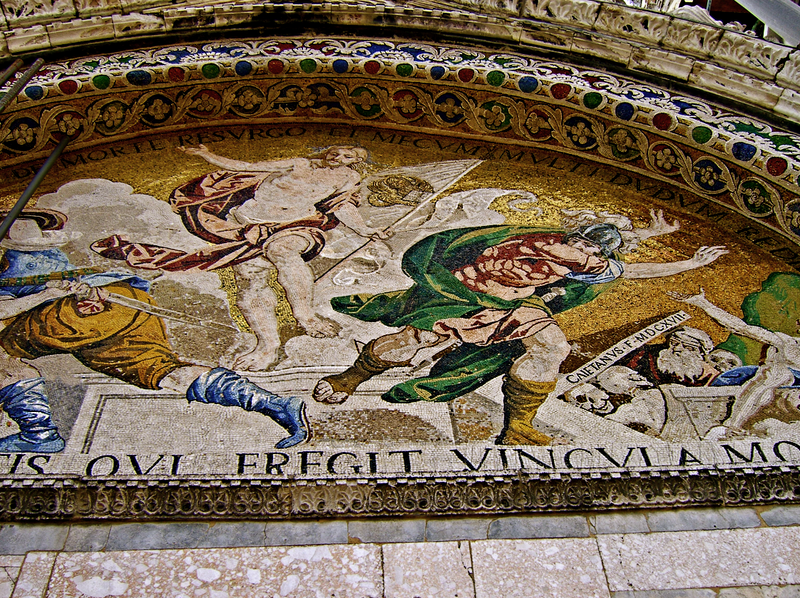 The patterns and illustrations are made of mosaic tiles, which are about the size of your thumbnail. The feelings of perspective, shade and shadow created in the design itself, and especially the glittering gold tiles, all add to the multitude of illusions and spirituality throughout the church. The artwork is so integrated into the architecture, that the designs are the building. 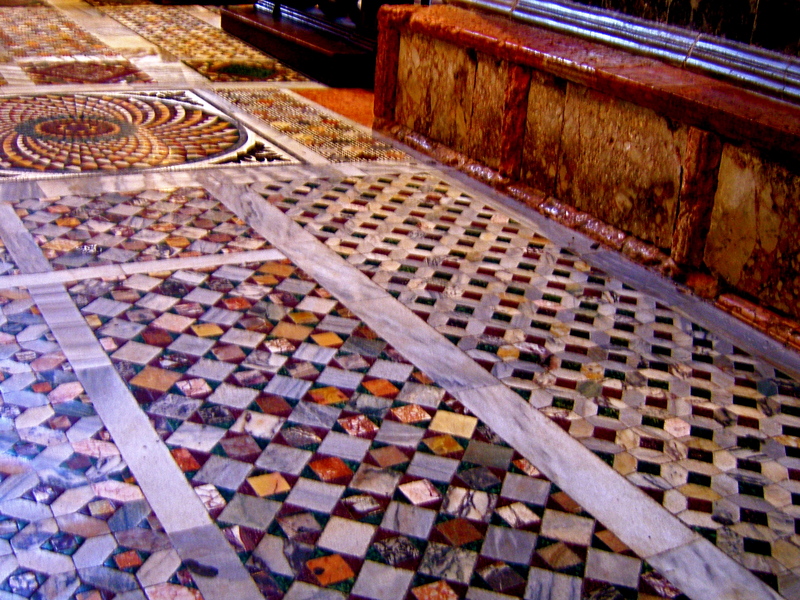 The tessellated floor designs alone are worthy of considerable admiration. 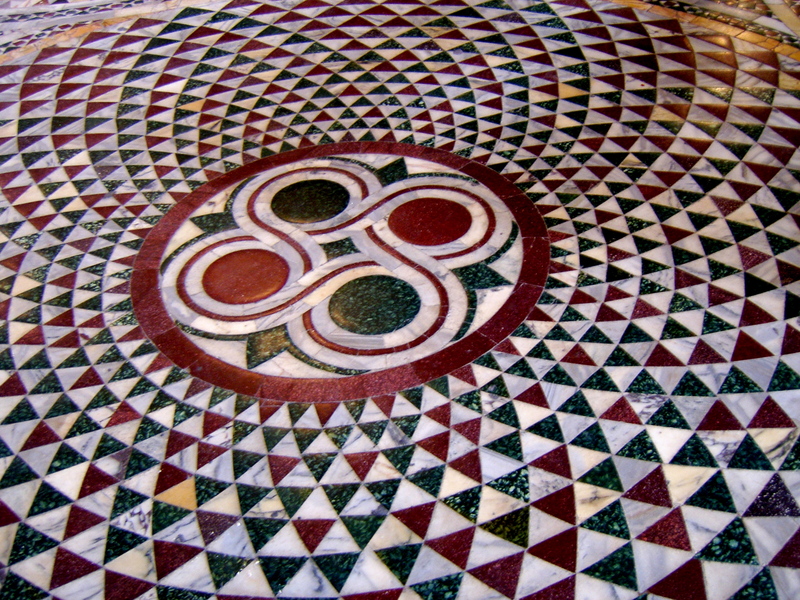 The method of design is known as “opus sectile,” which translates into “stone marquetry,” which is another way of describing stone pieces set into geometric patterns. The origin is Roman, and we have already seen examples of that. While the designs are original, constant maintenance and restoration are required, especially due to the multitudes who pass through. 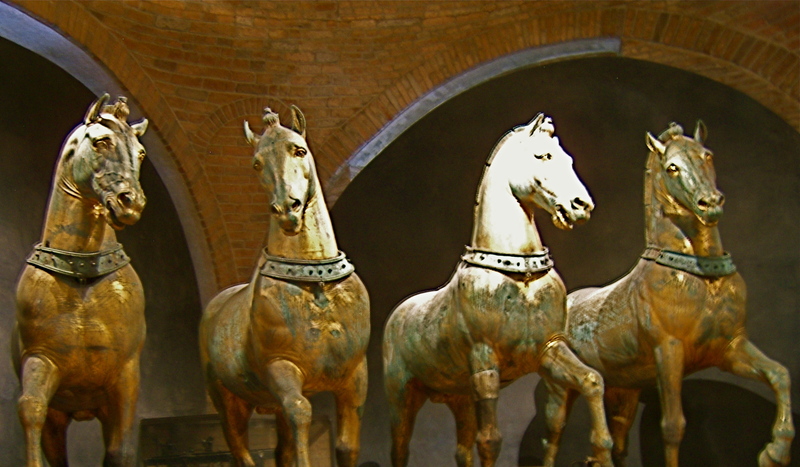 The four bronze horses shown here are the original four which, until fairly recently, were outside on the balcony over the main entrance to San Marco. They have a rich history - no one knows how real - but the story is that they were from a Triumphal Arch of either the Roman Emperor Trajan or Nero. Somehow they got to Constantinople, but were "rescued" in the Fourth Crusade (initiated in Venice), and brought to Venice in 1204. Napoleon took them to the Louvre (the Arc du Carrousel), but they were subsequently returned to Venice. The four copies on display out on the balcony. 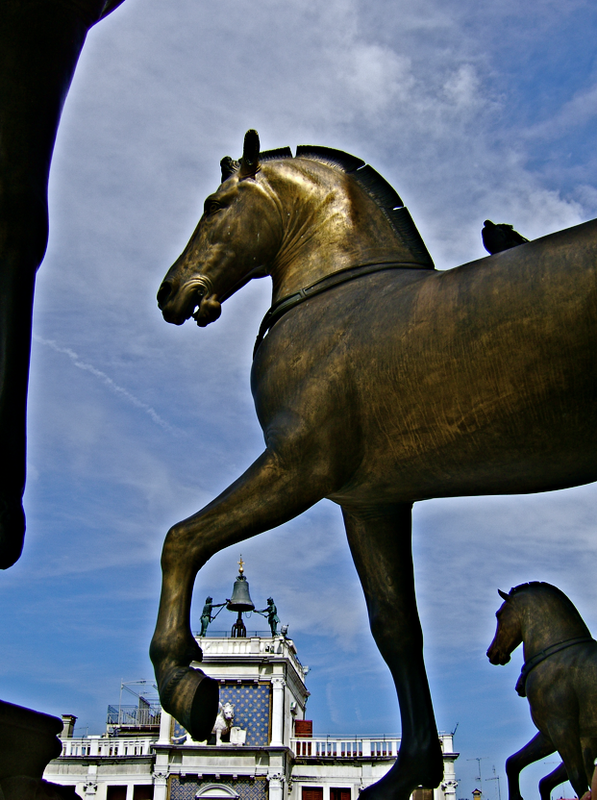 One of four bronze horses on this balcony. They are copies of the originals we have just seen. Their greatest tribulation seems to have been 20th century pollution, which has taken a terrible toll on everything in Venice. So copies were made, the originals brought inside and the copies placed on the balcony. 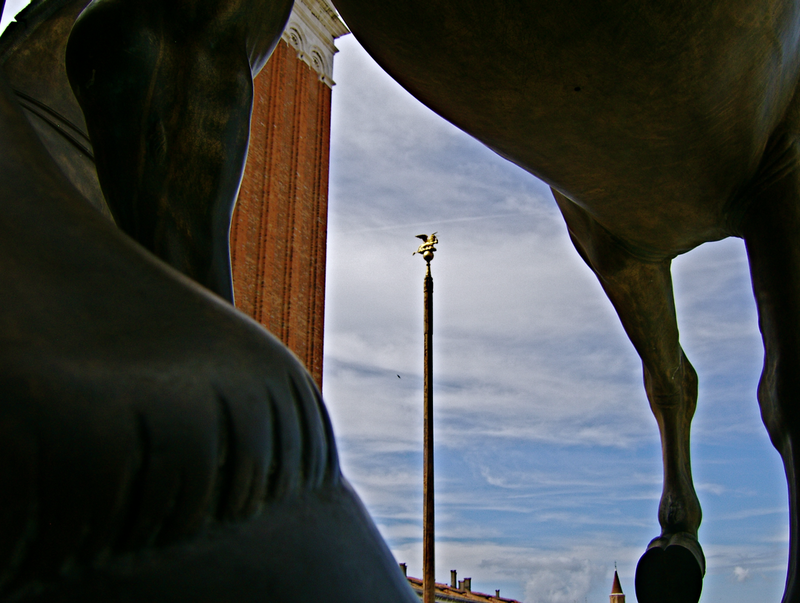 Actually, viewing the horses is so much better where they are now – inside on the second floor of the church. You can actually see them head-on inside, whereas the exterior ones are only visible from a full story below their balcony, or from underneath. 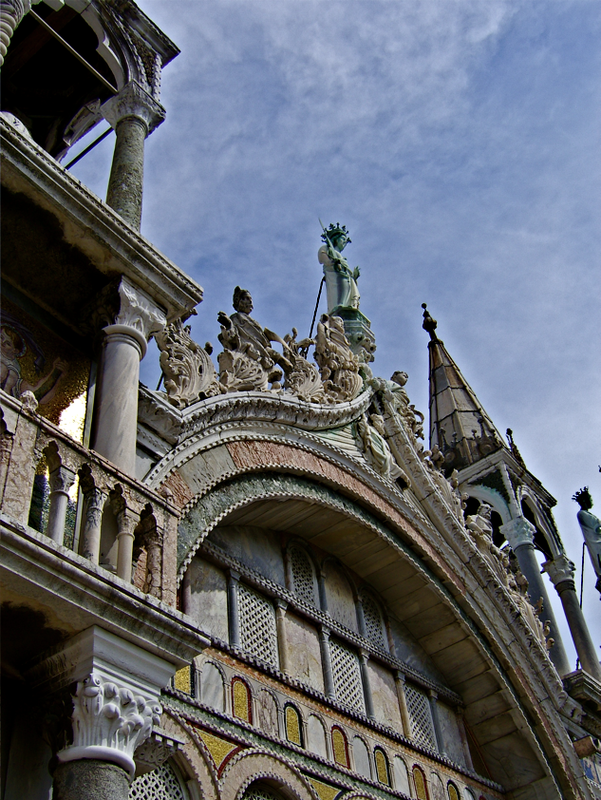 Out on that balcony, we can see the 15th century Venetian gothic niches, ogee arches, and pinnacles - of alabaster, marble and mosaic tiles.